Having a cheap VPS hosting with cPanel is a powerful way to host several websites. Just like a reseller hosting account, but with plenty more space and resources control. In the early 2000s a VPS server used to cost more than 90€ per month. Nowadays, you can order a VPS Server for less than 4€ only, with Linux operating system, plus the cPanel license (15€ per month). The VPS Server comes with cPanel installed. A valid license key is provided also. You can host unlimited websites. How much does it cost a cheap VPS hosting with cPanel? Copahost offers a variety of cheap VPS hosting plans from 3,59€ , and instant activation. We can help you performing the initial configurations of your server if you prefer. If you are unsure about what’s the best VPS hosting plan for you, you can contact Copahost and explain your needs. We will give you the best advice possible. The basic monthly cost is 3,59€ for the smallest VPS Server, plus 15€ for the cPanel license. Server resources are fully manageable. Wide backup options – You can perform backups of your server anytime. By FTP, through phpMyAdmin, R1soft, etc. Custom Apache compilation – You can compile apache with any module you need. Firewall configuration – You can install APF, CSF or any firewall option. Custom scripts and server configurations – You can perform very customized server configurations, that you weren’t able to do in a shared reseller package. In a VPS Server you are able to upgrade or downgrade resources anytime, without losing data. No long terms necessary: the VPS Hosting service is based in a month-to-month contract. Such hosting service allows you to increase or decrease your resources as per your company needs. If you are engaged in a marketing campaign, and you predicting to receive tons of visitors, just ask the support and you can have your server upgraded. The campaign ended, and you will no longer need the allocated resources? Just give a few clicks and your server will be brought back to its smaller resources. The cPanel VPS license allows you to perform every administrative task. Having a VPS With cPanel allows you to have the full control of your server. cPanel offers many server management possibilities. You can track CPU usage, Server load, memory usage, disk space, etc. It’s possible to identify customers or processes that are causing performance issues in your server. 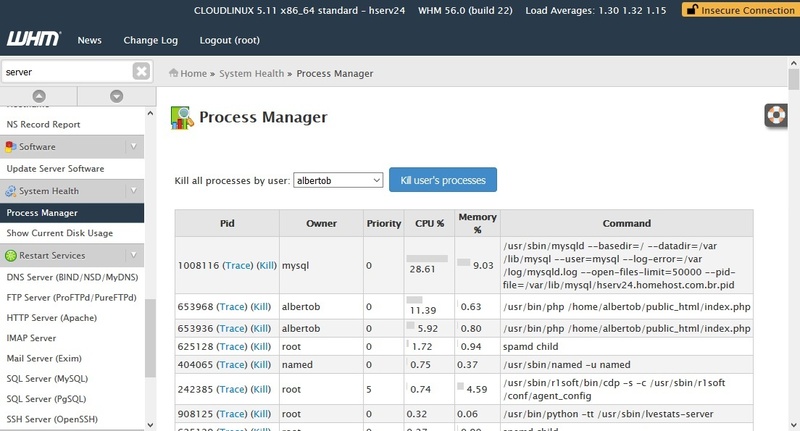 Each server process can be traced and mitigated, without any Linux command line knowledge. If you have your server with a slowdown, don’t worry. 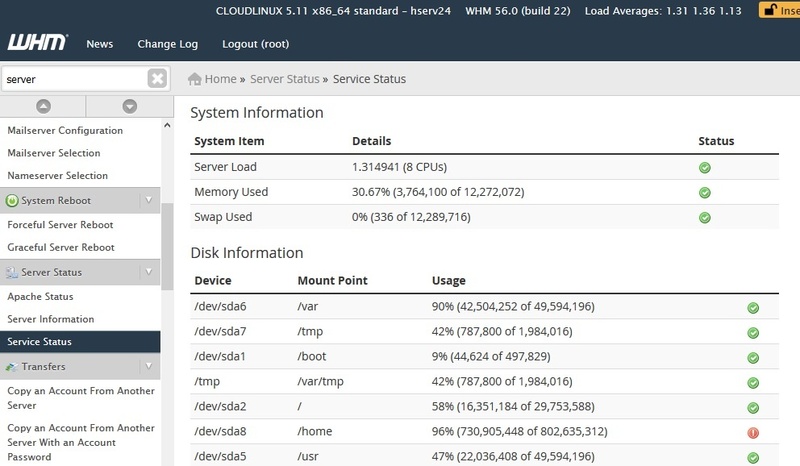 Just open the WHM control panel, perform a few clicks, and you will be able to find out what’s causing the issue quickly. MySQL usage and Apache can be mitigated quickly as well. Found a process causing problems? Just kill it. Found a customer generating overloads in your MySQL database? You can notify or suspend the customer immediately. Service restarts are also made within a few clicks. You can restart any service you wish in the section Restart Services. Managing a server used to take several hours, within the ’90s. When a customer asked to have an email account created, the sysop had to login into Linux terminal, edit several text files, recompile the email credentials, restart the email daemon, and then, answer the customer ticket for him to perform tests and validate the changes. What about customers losing their passwords? This was very frequent as well. Almost the same steps were necessary, just to recover an email simple password. In cPanel, with a few mouse clicks, you can add a hosting account, reset one password, create an email, and perform almost any administrative task with ease. Not only perform simple tasks: you can manage server resources like CPU, Processes, outgoing emails, spam control, etc. The cPanel control panel is divided into two sections: WHM for the reseller, and cPanel for the customer. 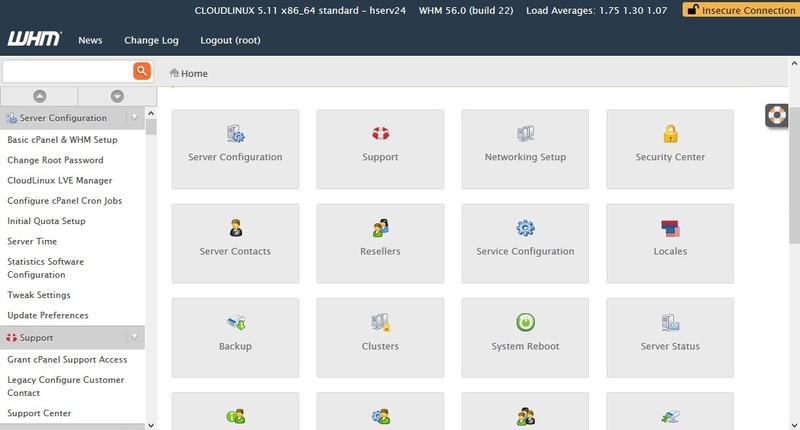 In cPanel, your customer can perform every task by itself, like changing passwords, creating email accounts, FTP accounts, managing its emails entirely, mass mailing lists, etc.. Each customer will have a complete control panel, where he can easily perform any common task without opening a trouble ticket. Another important advantage of having a cheap VPS hosting with cPanel is being able to customize your server as your needs. Installing Tomcat, Ruby, Django is perfectly possible. Many applications aren’t allowed in most of the cheap web hosting plans out there. Having a VPS Server allows you to customize your server configuration just like you need. cPanel has an automated interface to install custom Perl modules as well. cPanel also includes EasyApache, which is a graphic-guided apache compiler. In EasyApache you are able to choose the Apache web server and PHP versions, and install modules like LibGD, ImageMagick, PDO, and many others. All without technical experience. cPanel has improved a lot of its backup system. Now it’s possible to perform multiple backups in more than one location. You are able to have automated backups from the entire server, or from specific hosting accounts only. The backup will run in the background, nearly not affecting your server performance, and will let you know if any failure occurs. Even in a Cheap VPS Hosting with cPanel server, you are able to handle backups perfectly. Customers can perform backups of their content anytime, through their control panel as well. They can back up the entire site, or only email accounts, databases, etc.